The Poly RealPresence Group 500 solution is perfect for conference rooms and spaces designed for team collaboration of 2-8 people, from small huddle rooms to larger conference rooms with dual screens. Powerful video and audio performance with interactive content collaboration bring employees closer together and drives meaningful conversation for dispersed teams. Use the optional built-in multipoint to host video calls with up to 6 participants in HD quality. Included support for dual monitors helps participants see everything more clearly for meetings with greater impact. 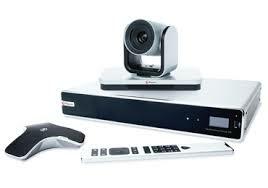 We also provide the Poly RealPresence Group 500 as a hire system, including the EagleEye IV camera, remote controller, microphone arrays and cables. Get in touch or visit our hire page for more information. VideoCentric’s partnership with Poly is built on a strong and well established relationship built over many years of sales, integration, solution development & infrastructure support. VideoCentric are fully accredited at Gold Partner Status with Poly and hold certifications including Video Conferencing Solutions, RealPresence Infrastructure and Video Border Proxy (security). VideoCentric have specialists fully trained in Poly Sales and Technical tracks, Poly RealPresence and Polycom Video Networking. VideoCentric have scooped top Poly awards for their extensive support and services offered to customers. VideoCentric also have the Polycom RealPresence Infrastructure integrated with Microsoft Teams, Microsoft Skype for Business, Microsoft Lync 2010, 2013 and Office 365 in our lab & interoperability testing suite, so we can fully understand the integration between each platform, the solution features & downfalls & how to fully support each solution deployed, whether on-premise, in the cloud or as a hybrid.